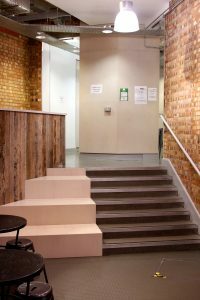 Our commercial painting and decorating team work on an ongoing basis for Soma Build, who specialise in high quality commercial fit-outs in London. In 2017 we worked for Soma at The Urdang Academy - a prestigious dance and theatrical school in Clerkenwell - and at Caramel, a children's clothing boutique in Fulham. In early 2018, we worked with Soma on the fit-out of the new temporary home for The Great Frog, the noted jewellery maker which has been based in Soho since 1972.